The name J.G. Wentworth might already sound familiar, thanks to the company’s brand recognition for structured settlements. Founded in 1991 as a merchant bank, the company’s grown to 600 employees and offers personal loans, prepaid credit cards and its signature structured settlements. The company is publicly traded under stock symbol JGWE and has headquarters located in Radnor, Pennsylvania. In 2015, J.G. 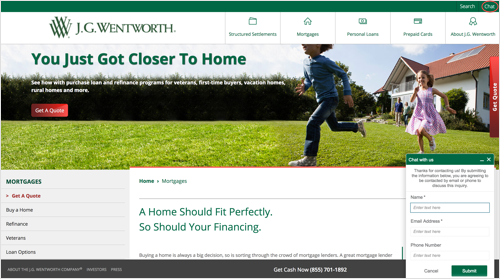 Wentworth added mortgages to its product offerings after acquiring WestStar Mortgage Inc. J.G. Wentworth Home Lending is headquartered in Woodbridge, Virginia. According to Consumer Finance Protection Bureau (CFPB) data, the company originated over 14,500 loans in 2015. A company representive told SmartAsset that J.G. Wentworth has funded over $10 billion in loans since its inception. It offers conventional lending options as well as VA, USDA and FHA loans. Homebuyers can find J.G. Wentworth home loans in offices in 14 states as well as online. Does J.G. Wentworth Mortgage Operate in My Area? J.G. Wentworth originates loans in every state and DC except Hawaii, Idaho, Missouri, Nevada and New York. The company has offices in Arizona, Connecticut, Florida, Georgia, Iowa, Kansas, Maryland, Michigan, New Hampshire, New Jersey, North Carolina, Pennsylvania, Texas and Virginia. What Kind of Mortgage Can I Get With J.G. Wentworth Mortgage? You have a number of options to choose from at J.G. Wentworth. The company has several options for conventional loan customers as well as those with low-to-moderate income and lower credit scores. Fixed-rate mortgage: Prefer predictability in your monthly payments? A fixed-rate mortgage may be your preferred loan. With this type of mortgage, your principal and interest payment won’t change throughout the course of the loan term. With J.G. Wentworth, you can apply for a 15-year or 30-year fixed-rate mortgage. This type of mortgage is often popular with those who plan on staying put for a decent amount of time. Adjustable-rate mortgage: Your loan will “adjust,” which means your interest will change after an initial fixed-interest period if you choose an ARM. J.G. Wentworth offers three, five or seven year ARMs; the numbers indicate how many years that the loan interest will stay the same before adjusting. Usually ARMs adjust interest once a year after the initial period expires. Some homebuyers apply for ARMs because of lower initial interest rates. If you’re planning on selling after a few years, this may be the option that saves you the most on interest payments. Federal Housing Administration (FHA) loan: FHA loans are an option for homebuyers with less than stellar credit history. These loans are designed for first-time homebuyers who don’t qualify for a conventional loan. You also have the option to pay only 3.5% down payment, instead of the usual 20%, with this type of loan. USDA loan: The U.S. Department of Agriculture (USDA) created this loan for people with low to moderate incomes who wish to purchase property in rural areas. Some of the features of USDA loans are no down payments and lower rates and fees. If you're interested in this type of loan, check that the property is located in an eligible area by using the USDA website. VA loans: Veteran Affairs loans are for current or former member of the U.S. Armed Forces, National Guard, Reserves and select spouses. J.G. Wentworth says it specializes in this type of loan. The advantages to VA loans include no down payment, no private mortgage insurance and competitive rates. Refinance: J.G. Wentworth features the federal government’s Home Affordable Refinance Program (HARP). You can apply for HARP if you’re not behind on your mortgage loan, closed on your loan prior to March 2009 along with a few other qualifying factors. What Can You Do Online With J.G. Wentworth Mortgage? You can start off by researching your loan options on J.G. Wentworth’s website. While the information is brief, you can get an idea of what loan option might be best for you. Unlike some lenders, J.G. Wentworth doesn’t offer homebuyer education resources, such as articles and blog posts. It’s a little more bare bones on this site, which may be fine for those wanting to get information over the phone or in person. The frequently asked questions section offers some information, but doesn’t cover all loan types or what J.G. Wentworth’s loan process timeline looks like. There is a chat feature if you want to ask questions digitally, but it’s not all-inclusive. Some mortgage questions will prompt the chat customer service representative to direct you to the main phone number. If you want a rate quote, J.G. Wentworth lets you input minimal information to see what you could potentially qualify for with current offer rates. Once you complete this process, you have the option of applying for a mortgage online. You can also apply for a mortgage by calling or visiting a branch in person. As for mobile, J.G. 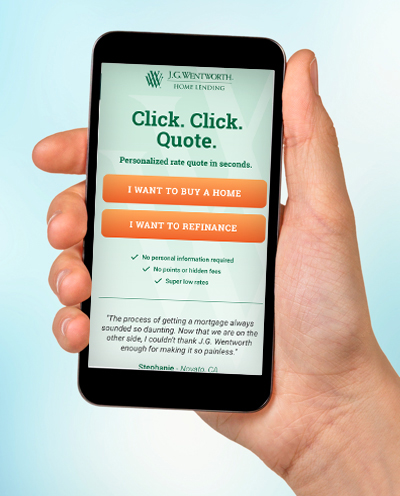 Wentworth’s site is mobile-friendly for rate quotes, and that’s about it. While upgrades may be in the pipeline, at the moment you can’t do much from your phone. Once you have a mortgage through J.G. Wentworth, you can create an account and monitor your loan online. Would You Qualify for a J.G. Wentworth Mortgage? When you apply for a J.G. Wentworth mortgage, one of the first factors considered is your credit score. If you know you have bad credit, it’s best to wait until you’ve improved your score to apply for a mortgage. You’ll qualify for the best rates with a higher score which helps you save possibly thousands of dollars over the course of the loan. While J.G. Wentworth doesn’t display credit requirements outright on its website, usually the rule of thumb is around 700 FICO score to qualify for a conventional loan and 620 as a minimum for some government-backed loans. Since the specifics aren’t displayed, you can call the company or try the online chat to see if you’d qualify for a loan with your credit score. As always, a higher score is ideal for any mortgage application. After credit scores, most lenders will dive into your employment history. You’ll need about two years proof of employment using documents such as W-2s and pay stubs. If you’re self-employed, you may need to show additional documents to prove your income. Your savings will also be analyzed to verify that you can cover a down payment. While some programs such as VA loans and FHA loans require less than 20%, most conventional mortgages come with a 20% down payment requirement. If you can’t afford that amount, private mortgage insurance is an option to research. Next is debt-to-income consideration. This ratio or percentage is calculated by taking your monthly debt and monthly income. Debt can include credit card debt, car payments, child support, student loans and other mortgages. General guidelines usually point to 45% debt-to-income max, as in the case of FHA loans, but many lenders will have a lower maximum. You’ll probably want to pay down debt to lower your ratio if you’re around that percentage. What’s the Process for Getting a Mortgage With J.G. Wentworth? The first thing to do is check your credit. J.G. Wentworth warns that a low credit score or credit fraud can stop your application from going forward. If you know your score is in the correct range for a mortgage, you can get started in a number of ways. If you’re near one of J.G. Wentworth’s physical locations, you can apply for a mortgage in person. If not, you can fill out an online form that will provide you with a quote estimate and then give you the option of applying online. Finally, you can call the company yourself. For any mortgage application, you’ll need personal and financial information for yourself and your co-borrower, if applicable. You’ll start with the basics, such as your address, Social Security number and contact information. As you progress, expect to provide employment information, such as pay stubs and tax returns, and bank information such as account numbers. The mortgage lender needs to verify your ability to afford monthly mortgage payments as well as a down payment, so all of your financial factors will come into play during the application process. Once you’re approved, you’ll coordinate a closing date and continue with your loan officer until you finalize the home purchase. At the time of closing, you’re required to pay closing costs as well as additional fees. You’ll need to set aside about 3% to 5% of your home price to cover things such as origination fees from the lender as well as a number of other charges. Your loan officer should be able to discuss the fee breakdown with you if any questions come up. While not quite a household name for mortgages, J.G. Wentworth has some skin in the game thanks to its acquisition of WestStar Mortgage, a deal that included acquiring current and pending customers. However, the company isn’t as widely available as many of its competitors. J.G. Wentworth offers loans in 45 out of 50 states, and has physical offices in 14 states. While its physical locations are more than some online-only lenders such as Rocket Mortgage or Better.com, it’s not close to the level of Wells Fargo with 1,200 locations or U.S. Bank. If you’d like to work with a loan officer in person, you’d have to be near one of J.G. Wentworth’s limited locations or you could turn to a larger financial institution that’s near you. Those looking for a sleek online experience might be disappointed with J.G. Wentworth’s current website. The information offered is thin in some locations such as homebuyer education and the frequently asked questions page. If you try to find more detailed information, you can try the chat feature. That said, many questions will prompt the chat representative to direct you to call the main phone line, which points to this company’s digital weaknesses. Closing costs and other fees can really ramp up your initial loan costs when you're getting a new mortgage. It might seem unlikely, but some sellers will lower the price of the home in order to help you cover these costs in the interest of selling. To prepare and manage a new mortgage can be an overwhleming venture. Financial advisors are helpful not only when it comes to planning for retirement and investments, but also all other financial aspects of your life, including home loans. The SmartAsset financial advisor matching tool is a great opportunity to get paired up with up to three such advisors who work nearby.